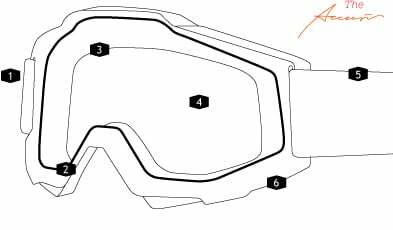 100% Accuri motocross goggles are brought to you by 100% (Ride 100 Percent). These ergonomically designed Accuri goggles from 100% have maximum comfort with an extra wide elastic covered 4.5cm silicon strap for a perfect fit on your helmet. 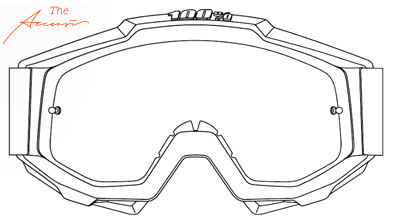 1 - Simplicity: All 100% MX goggles share the same lens and tear-off profile. 2 - Fitment: Curvature suited for comfort. 3 - Foam: Thirsty triple layer moisture managing foam helps to keep the sweat out of your eyes. 4 - Lens: Anti-fog coated Lexan lens for flawless vision. The frame has a raised section at the top of the lens to offer a bit more vision, and the peripheral landscape is incredible. 5 - Strap: The Accuri goggle has a strap that’s as wide as a landing strip. At 45mm wide, the elastic strap is robust. It’s also has a wide bead of silicone prevents the massive strap from sliding. 6 - Frame: The Accuri frame is made of urethane, flexible and resistant to any test. Buy 100% Accuri Motocross Goggles at Dirtbikexpress, the UK's favourite motocross store.